Note: I am not as expert in time-series analysis as I am in other areas of Analytics, so if you find errors I would be happy to know about them and correct them. ARIMA models are, in theory, the most general class of models for forecasting a time series, which can be made to be “stationary” by differencing (if necessary), perhaps in conjunction with nonlinear transformations such as logging or deflating (if necessary). 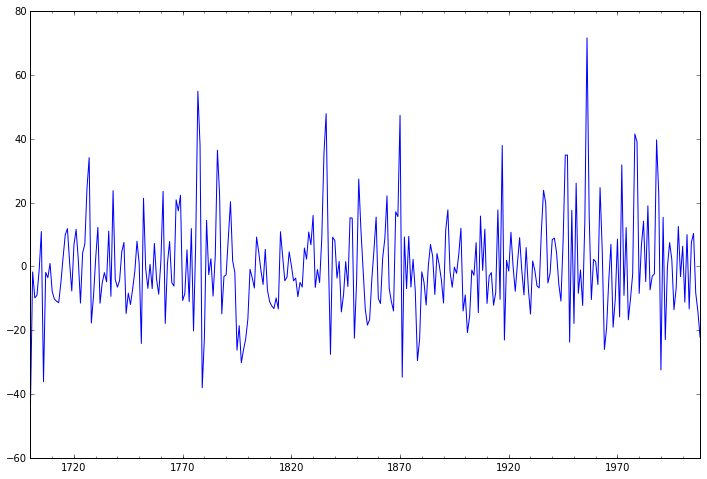 A random variable that is a time series is stationary if its statistical properties are all constant over time. 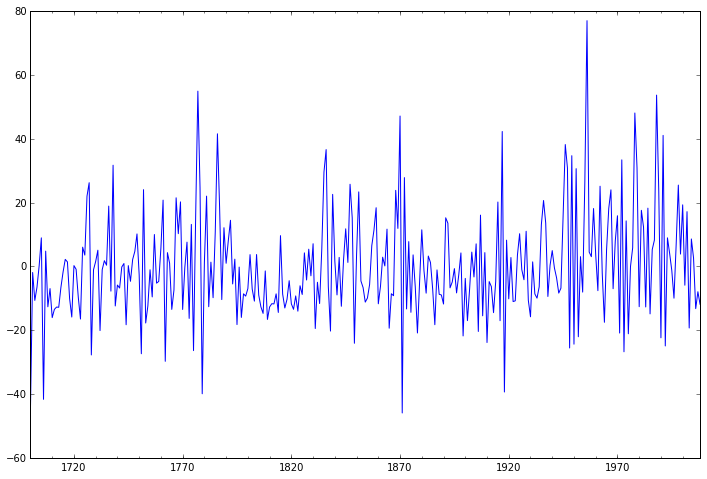 A stationary series has no trend, its variations around its mean have a constant amplitude, and it wiggles in a consistent fashion, i.e., its short-term random time patterns always look the same in a statistical sense. The latter condition means that its autocorrelations (correlations with its prior deviations from the mean) remain constant over time, or equivalently, that its power spectrum remains constant over time. A random variable of this form can be viewed (as usual) as a combination of signal and noise, and the signal (if one is apparent) could be a pattern of fast or slow mean reversion, or sinusoidal oscillation, or rapid alternation in sign, and it could also have a seasonal component. An ARIMA model can be viewed as a “filter” that tries to separate the signal from the noise, and the signal is then extrapolated into the future to obtain forecasts. 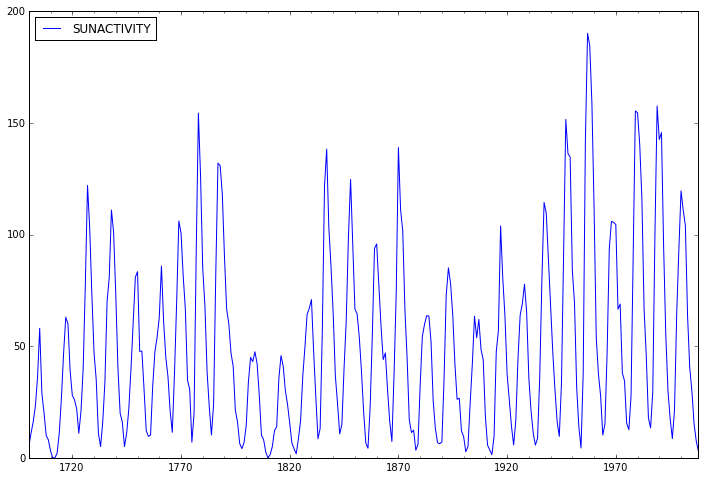 The data we will use is annual sunspot data from 1700 – 2008 recording the number of sunspots per year. The file sunspots.csv and can be downloaded from the line below. In addition to Statsmodels, we will need to import additional packages, including Numpy, Scipy, Pandas, and Matplotlib. Also, from Statsmodels we will need to import qqplot. We will use pandas to load the .csv file which we downloaded earlier. Next we check to see that the data uploaded correctly by viewing the dataset Notes. The data file contains a 'YEAR' variable that is not returned by load. Next we need to do a little dataset preparation. Here, an annual date series must be date-times at the end of the year. Now we take a look at the data. Before we decide which model to use, we need to look at auto-correlations. 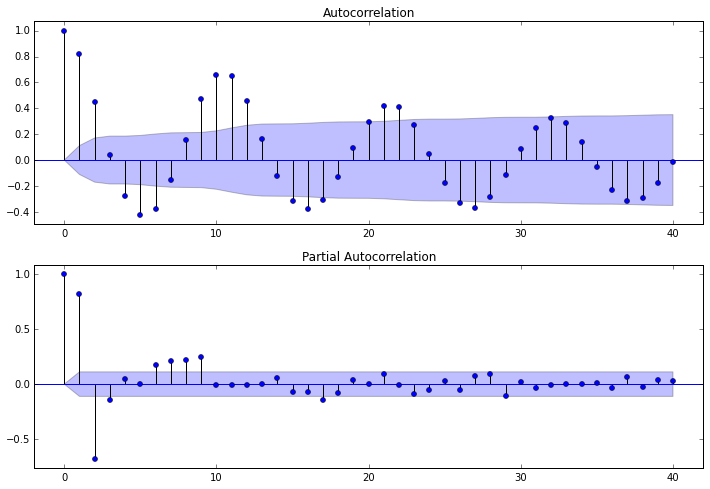 Autocorrelation correlogram. Seasonal patterns of time series can be examined via correlograms, which display graphically and numerically the autocorrelation function (ACF). Auto-correlation in pandas plotting and statsmodels graphics standardize the data before computing the auto-correlation. These libraries subtract the mean and divide by the standard deviation of the data. When using standardization, they make an assumption that your data has been generated with a Gaussian law (with a certain mean and standard deviation). This may not be the case in reality. Correlation is sensitive. Both (matplotlib and pandas plotting) of these functions have their drawbacks. The figure generated by the following code using matplotlib will be identical to figure generated by pandas plotting or statsmodels graphics. Partial autocorrelations. 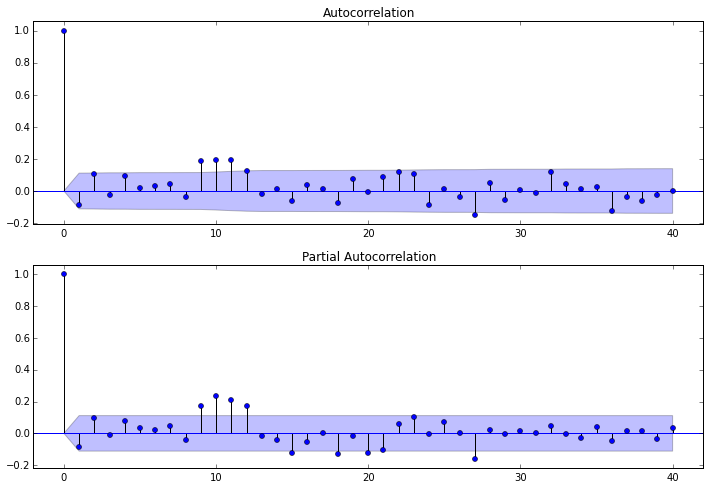 Another useful method to examine serial dependencies is to examine the partial autocorrelation function (PACF) – an extension of autocorrelation, where the dependence on the intermediate elements (those within the lag) is removed. Once we determine the nature of the auto-correlations we use the following rules of thumb. Rule 3: If the ACF has a spike at lag 1, no correlation for other lags, and the PACF damps out exponentially, then use one moving average (q) parameter. 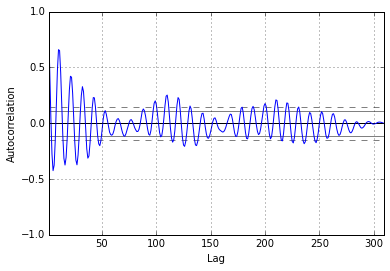 Rule 4: If the ACF has spikes at lags 1 and 2, no correlation for other lags, and the PACF has a sine-wave shape pattern or a set of exponential decays, then use two moving average (q) parameter. Rule 5: If the ACF shows exponential decay starting at lag 1, and the PACF shows exponential decay starting at lag 1, then use one autoregressive (p) and one moving average (q) parameter. Removing serial dependency. Serial dependency for a particular lag can be removed by differencing the series. There are two major reasons for such transformations. First, we can identify the hidden nature of seasonal dependencies in the series. Autocorrelations for consecutive lags are interdependent, so removing some of the autocorrelations will change other auto correlations, making other seasonalities more apparent. Second, removing serial dependencies will make the series stationary, which is necessary for ARIMA and other techniques. Another popular test for serial correlation is the Durbin-Watson statistic. The DW statistic will lie in the 0-4 range, with a value near two indicating no first-order serial correlation. Positive serial correlation is associated with DW values below 2 and negative serial correlation with DW values above 2. The value of Durbin-Watson statistic is close to 2 if the errors are uncorrelated. In our example, it is 0.1395. That means that there is a strong evidence that the variable open has high autocorrelation. 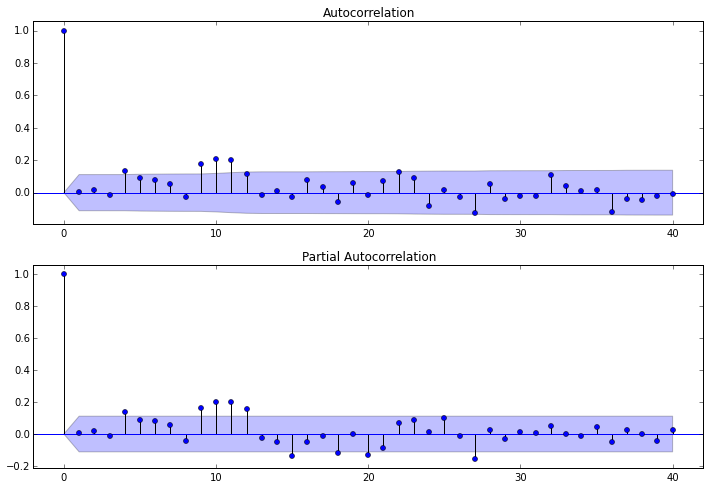 The plots also indicate that autocorrelation is present. Another set of plots (shown below) are available using the autocorrelation_plot function from Pandas. For mixed ARMA processes the Autocorrelation function is a mixture of exponentials and damped sine waves after (q-p) lags. 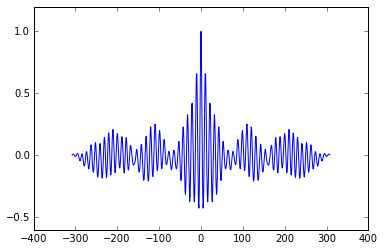 The partial autocorrelation function is a mixture of exponentials and dampened sine waves after (p-q) lags. We see that the AR(1) model has the form of a regression model in which yt is regressed on its previous value. In this form, at is analogous to the negative of the regression coefficient, and et to the regression residuals. The name autoregressive refers to the regression on self (auto). 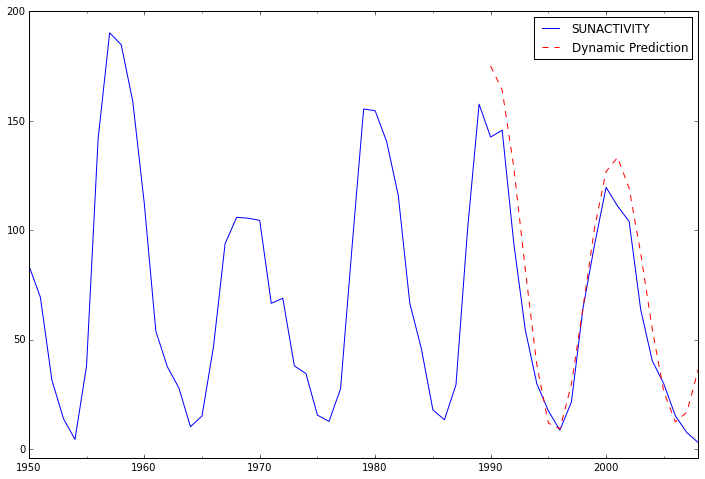 Note that the second difference of Y (the d=2 case) is not the difference from two periods ago. Rather, it is the first-difference-of-the-first difference, which is the discrete analog of a second derivative, i.e., the local acceleration of the series rather than its local trend. Using Rule 2 from above, we will first try an ARMA(2,0) model with two autoregressive terms and no moving averages. We now calculate the Akaike Information Criterion (AIC), Schwarz Bayesian Information Criterion (BIC), and Hannan-Quinn Information Criterion (HQIC). Our goalis to choose a model that minimizes (AIC, BIC, HQIC). Does our model obey the theory? We will use the Durbin-Watson test for autocorrelation. The Durbin-Watson statistic ranges in value from 0 to 4. 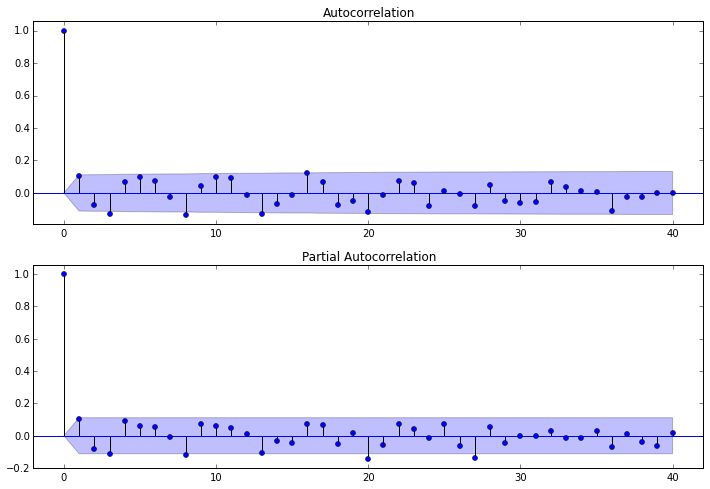 A value near 2 indicates non-autocorrelation; a value toward 0 indicates positive autocorrelation; a value toward 4 indicates negative autocorrelation. The Durbin-Watson test shows no autocorrelation. Next we plot and study the data it represents. In the following steps, we calculate the residuals, tests the null hypothesis that the residuals come from a normal distribution, and construct a qq-plot. Now we investigate the autocorrelation of our ARMA(2,0) model. Next, we calculate the lag, autocorrelation (AC), Q statistic and Prob>Q. The Ljung–Box Q test (named for Greta M. Ljung and George E. P. Box) is a type of statistical test of whether any of a group of autocorrelations of a time series are different from zero. The null hypothesis is, H0: The data are independently distributed (i.e. the correlations in the population from which the sample is taken are 0, so that any observed correlations in the data result from randomness of the sampling process). Notice that the p-values for the Ljung–Box Q test all are well above .05 for lags 1 through 8, indicating “significance.” This is not a desirable result. However, the p-values for the remaining lags through 40 data values as less than .05. So there is much data not contributing to correlations at high lags. Next, we compute the predictions and analyze their fit against actual values. The fit looks good up to about 1998 and underfit the data afterwards. Mean absolute error: The mean absolute error (MAE) value is computed as the average absolute error value. If this value is 0 (zero), the fit (forecast) is perfect. 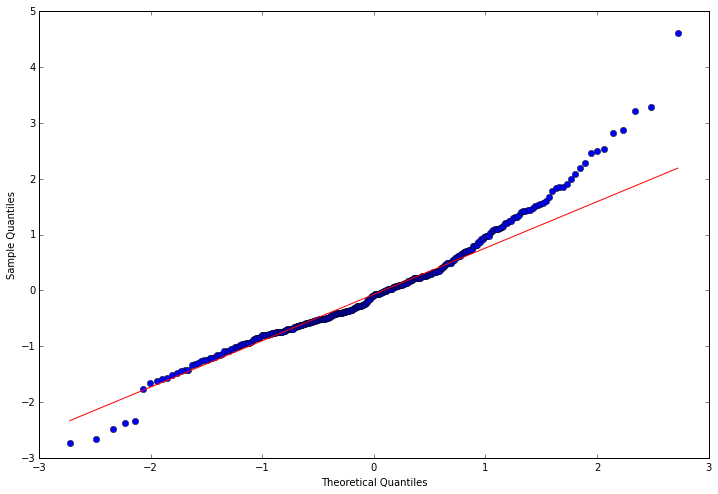 As compared to the mean squared error value, this measure of fit will “de-emphasize” outliers, that is, unique or rare large error values will affect the MAE less than the MSE value. Mean Forecast Error (Bias). The mean forecast error (MFE) is the average error in the observations. A large positive MFE means that the forecast is undershooting the actual observations, and a large negative MFE means the forecast is overshooting the actual observations. A value near zero is ideal. The MAE is a better indicator of fit than the MFE. For MFE > 0, models tends to under-forecast. However, as long as the tracking signal is between –4 and 4, we assume the model is working correctly. The measure of MAE being small would indicate a pretty good fit. 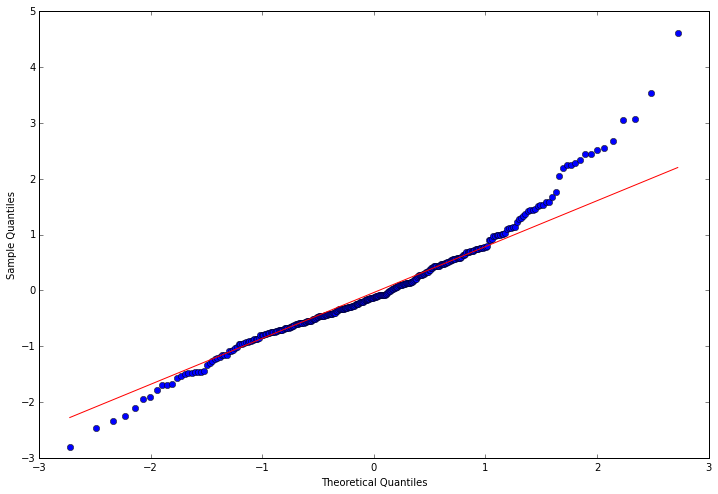 As a second model, we will try an ARMA(3,0) model with three autoregressive terms and no moving averages. Does our model obey the theory? The Durbin-Watson is lose to 2, so the test shows very little if any positive autocorrelation. This could indicate a lack of fit. Notice that the p-values for the Ljung–Box Q test all are well above 0.05 for lags 1 through 8, indicating “significance.” This is not a desirable result. However, the p-values for the remaining lags through 40 data values as less than 0.05. So there is much data not contributing to correlations at high lags. In-sample dynamic prediction. How well does our model do? For small MAE the model is a pretty good fit. The MFE being slightly above 4 might indicate the model tends to under-forecast. As a third model, we will try an ARMA(2,1) model with two autoregressive terms and one moving average term. print "Metric for ARMA(2,1):    ",mean_forecast_err(dta.SUNACTIVITY, predict_sunspots40),"MFE"
print "Metric for ARMA(2,1):    ",mean_absolute_err(dta.SUNACTIVITY, predict_sunspots40),"MAE"
As a fourth model we will try an ARMA(2,3) model with three autoregressive terms and two moving averages. print "Metric for ARMA(3,2):    ",mean_forecast_err(dta.SUNACTIVITY, predict_sunspots50),"MLE"
print "Metric for ARMA(3,2):    ",mean_absolute_err(dta.SUNACTIVITY, predict_sunspots50),"MAE"
As a fifth model we will try an AIMA(3,0,2) model with three autoregressive terms, no differences, and two moving averages. print "Metrics for ARIMA(3,0,2): ",mean_forecast_err(dta.SUNACTIVITY, predict_sunspots1),"MLE"
print "Metrics for ARIMA(3,0,2): ",mean_absolute_err(dta.SUNACTIVITY, predict_sunspots1),"MAE"
Now let’s examine a sixth model. print "Metrics for ARIMA(2,0,3): ",mean_forecast_err(dta.SUNACTIVITY, predict_sunspots2),"MLE"
print "Metrics for ARIMA(2,0,3): ",mean_absolute_err(dta.SUNACTIVITY, predict_sunspots2),"MAE"
Now let’s compare all six ARMA models using the metrics we have discussed. print "Metrics for Model 1 ARMA(2,0):    ",mean_forecast_err(dta.SUNACTIVITY, predict_sunspots20)," MFE  ", mean_absolute_err(dta.SUNACTIVITY, predict_sunspots20),"MAE"
print "Metrics for Model 2 ARMA(3,0):    ",mean_forecast_err(dta.SUNACTIVITY, predict_sunspots30)," MFE  ", mean_absolute_err(dta.SUNACTIVITY, predict_sunspots30),"MAE"
print "Metrics for Model 3 ARMA(2,1):    ",mean_forecast_err(dta.SUNACTIVITY, predict_sunspots40)," MFE  ", mean_absolute_err(dta.SUNACTIVITY, predict_sunspots40),"MAE"
print "Metrics for Model 4 ARMA(2,3):    ",mean_forecast_err(dta.SUNACTIVITY, predict_sunspots50)," MFE  ", mean_absolute_err(dta.SUNACTIVITY, predict_sunspots50),"MAE"
print "Metrics for Model 5 ARIMA(3,0,2): ",mean_forecast_err(dta.SUNACTIVITY, predict_sunspots1)," MFE  ", mean_absolute_err(dta.SUNACTIVITY, predict_sunspots1),"MAE"
print "Metrics for Model 6 ARIMA(2,0,3): ",mean_forecast_err(dta.SUNACTIVITY, predict_sunspots2)," MFE  ", mean_absolute_err(dta.SUNACTIVITY, predict_sunspots2),"MAE"
Clearly Model 5 minimizes (aic, bic, hqic). However, Model 1 has the smallest MFE and MAE. In terms of consistency, Model 2 minimizes AIC, BIC, HQIC, MFE and MAE. Also, ARIMA(3,0,2) has the lowest AIC, BIC and HQIC values, though it slightly overfits. Notice that ARIMA(2,0,3) and ARMA(2,3) are the same. Why? Based on the analysis, I would be conservative and choose Model 1, ARMA(2,0), above the other models. Now lets build a few model models for comparison. Note we will renumber the models as well. We caclualue AIC, BIC, and HQIC. Now we calculate predictions for each model. Now we calculate MFE and MAE for each model. print "Metrics for Model 01 ARMA(1,0):    ",mean_forecast_err(dta.SUNACTIVITY, predict_sunspots10)," MFE  ", mean_absolute_err(dta.SUNACTIVITY, predict_sunspots10),"MAE"
print "Metrics for Model 02 ARMA(2,0):    ",mean_forecast_err(dta.SUNACTIVITY, predict_sunspots20)," MFE  ", mean_absolute_err(dta.SUNACTIVITY, predict_sunspots20),"MAE"
print "Metrics for Model 03 ARMA(3,0):    ",mean_forecast_err(dta.SUNACTIVITY, predict_sunspots30)," MFE  ", mean_absolute_err(dta.SUNACTIVITY, predict_sunspots30),"MAE"
print "Metrics for Model 04 ARMA(2,1):    ",mean_forecast_err(dta.SUNACTIVITY, predict_sunspots40)," MFE  ", mean_absolute_err(dta.SUNACTIVITY, predict_sunspots40),"MAE"
print "Metrics for Model 05 ARMA(2,3):    ",mean_forecast_err(dta.SUNACTIVITY, predict_sunspots50)," MFE  ", mean_absolute_err(dta.SUNACTIVITY, predict_sunspots50),"MAE"
print "Metrics for Model 06 ARIMA(3,0,2): ",mean_forecast_err(dta.SUNACTIVITY, predict_sunspots1)," MFE  ", mean_absolute_err(dta.SUNACTIVITY, predict_sunspots1),"MAE"
print "Metrics for Model 07 ARIMA(2,0,2): ",mean_forecast_err(dta.SUNACTIVITY, predict_sunspots2)," MFE  ", mean_absolute_err(dta.SUNACTIVITY, predict_sunspots2),"MAE"
print "Metrics for Model 08 ARIMA(1,0,0): ",mean_forecast_err(dta.SUNACTIVITY, predict_sunspots3)," MFE  ", mean_absolute_err(dta.SUNACTIVITY, predict_sunspots3),"MAE"
print "Metrics for Model 09 ARIMA(0,1,0): ",mean_forecast_err(dta.SUNACTIVITY, predict_sunspots4)," MFE  ", mean_absolute_err(dta.SUNACTIVITY, predict_sunspots4),"MAE"
print "Metrics for Model 10 ARIMA(0,0,1): ",mean_forecast_err(dta.SUNACTIVITY, predict_sunspots5)," MFE  ", mean_absolute_err(dta.SUNACTIVITY, predict_sunspots5),"MAE"
print "Metrics for Model 11 ARIMA(1,1,0): ",mean_forecast_err(dta.SUNACTIVITY, predict_sunspots6)," MFE  ", mean_absolute_err(dta.SUNACTIVITY, predict_sunspots6),"MAE"
print "Metrics for Model 12 ARIMA(0,1,1): ",mean_forecast_err(dta.SUNACTIVITY, predict_sunspots7)," MFE  ", mean_absolute_err(dta.SUNACTIVITY, predict_sunspots7),"MAE"
print "Metrics for Model 13 ARIMA(1,1,1): ",mean_forecast_err(dta.SUNACTIVITY, predict_sunspots8)," MFE  ", mean_absolute_err(dta.SUNACTIVITY, predict_sunspots8),"MAE"
print "Metrics for Model 14 ARIMA(3,0,3): ",mean_forecast_err(dta.SUNACTIVITY, predict_sunspots9)," MFE  ", mean_absolute_err(dta.SUNACTIVITY, predict_sunspots9),"MAE"
print "Metrics for Model 15 ARIMA(1,0,6): ",mean_forecast_err(dta.SUNACTIVITY, predict_sunspots10)," MFE  ", mean_absolute_err(dta.SUNACTIVITY, predict_sunspots10),"MAE"
print "Metrics for Model 16 ARIMA(1,0,3): ",mean_forecast_err(dta.SUNACTIVITY, predict_sunspots11)," MFE  ", mean_absolute_err(dta.SUNACTIVITY, predict_sunspots11),"MAE"
Model 14 ARIMA(2,0,3) has relatively good values for AIC, BIC, HQIC, and MAE, but not MFE and underfits (MFE = 5.2779 > 4). Model 02 ARMA(2,0) has the next best MAE and a relatively good BIC, but slightly underfits (MFE = 4.7303 > 4). Model 01 ARMA(2,1) and ARMA(2,3) are not as good as ARMA(2,0). However, look at ARMA(1,0). It has the same AIX, BIC, and HQIC, but it minimizes MFE and MAE. We choose Model 01 ARMA(1,0) as the best model based on these results. However, I would take the best performing model and plot their prediction and compare them. Now try to build ARNA(3,2) on your own and compare it with the best model.